Cooler autumn days call for delicious warming breakfasts packed full of goodness. 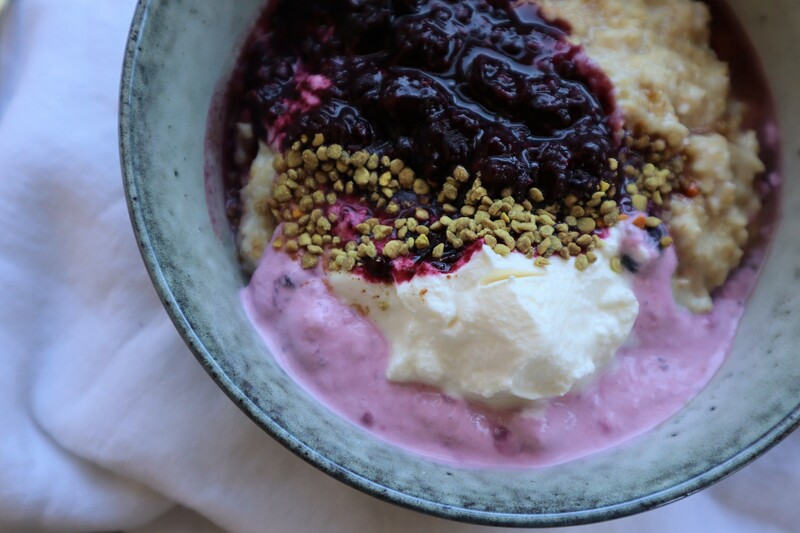 Creamy hearty porridge mixed with late season berries, natural yoghurt and sweet bee pollen is the perfect start to any day. In a small bowl mix 1 tablespoon of mixed berry coulis with 2 tablespoons of natural Greek yoghurt, set aside. Cook instant oats in soy milk on stove top or in microwave until the porridge is creamy and cooked through. Add to a bowl, top with berry yoghurt and remaining coulis. Dollop remaining Greek yoghurt on top and drizzle honey over the warm oats. Sprinkle bee pollen and cinnamon on top. Serve and enjoy! ELE tip – for extra goodness try adding chopped almonds, sliced banana or stewed apple to this recipe. *Bee Pollen is packed full of protein, minerals and vitamins and is available in most health food stores.